When Kateri Tekakwitha, a Mohawk Indian, converted to Catholicism in 1676, she did it with gusto, writes Bill Donahue in his new e-book The Secret World of Saints. She slept on a bed of thorns. She had a friend whip her. She put hot coals between her toes. She fasted, and took care of the sick and elderly. When she died, it was said, the scars from the smallpox she suffered as a child instantly vanished from her face. It wasn’t long before people began to credit her with miracles. Last week, the Vatican announced that Tekakwitha is, indeed, a miracle maker: She will be named a saint, perhaps as early as next fall. But what, exactly, does that mean? How does someone become a saint? What’s the vetting process? In his thoroughly entertaining investigation, The Secret World of Saints, published by Byliner on December 23, 2011, Bill Donahue tells the little-known story of how the holy get their halos. The journey to canonization is long (it can take centuries), lurid (decayed body parts play a role), and, nowadays, surprisingly cutting-edge. Tekakwitha earned her saint status thanks to a medical miracle she caused in 2006: Experts in the Catholic Church studied MRIs and hospital records and eventually came to the conclusion that a force stronger than modern medicine saved the victim. In addition to Tekakwitha, Donahue introduces us to a cast of celestial characters, from Mother Teresa and Pope John Paul II—both on the fast track to sainthood—to Saint Francis, Joan of Arc, and the shady Padre Pio, who claimed to suffer stigmata and raise bodies from the dead. Mixing legend and science, history and on-the-ground reporting, The Secret World of Saints sheds light on one of the Catholic Church’s most arcane and captivating traditions. Bill Donahue is a practicing Catholic who lives in Portland, Oregon. His work has appeared in The Atlantic, The New York Times Magazine, and The Washington Post Magazine. He has been nominated for two National Magazine Awards, and his stories have been reprinted in Best American Travel Writing, Best American Sports Writing, and numerous other anthologies. Byliner publishes compelling works of original fiction and nonfiction written to be read in a single sitting. Among its bestselling titles are Amy Tan’s Rules for Virgins, Jon Krakauer’s Three Cups of Deceit, Ann Patchett’s The Getaway Car, William T. Vollmann’s Into the Forbidden Zone, Taylor Branch’s The Cartel, and Mark Bittman’s Cooking Solves Everything. The companion website, Byliner.com, features curated archives of the best fiction and nonfiction writing, and allows readers to easily find, share, and buy new and classic works by their favorite authors. The Secret World of Saints is available for $1.99 in the Amazon Kindle Singles store, at BarnesAndNoble.com, as a Quick Read in Apple’s iBook store, and in the Google eBookstore. 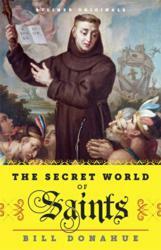 For an Advanced Reader Copy of The Secret World of Saints or to schedule an interview with Bill Donahue, please contact Clare Hertel at clare(at)byliner(dot)com; 505-474-6783.